We’ve all done it; and it is just terrible. No one likes nicking themselves while they shave (that we know of?). So why does it continue to happen to us? I know what you’re thinking, “well, guy, we’re taking a darn razor to our face, so what do you expect? !” Valid point, my friend, however, what if I told you it’s completely unavoidable, you just have to make a few simple tweaks to your daily shave routine, and there will be no more nasty cuts to worry about? Sounds great, right? Well, it’s no worries at all my friend; we’re going to share all of our secrets with you in 10 easy tips that will keep you from ever having to rip off a corner of toilet paper and dab it on your cut again. 1. Make sure your razor is sharp. Really sharp. Like all the time. If your razor even has a hint of going dull, sharpen that thing up or go to a new razor. This concept is something I learned in Boy Scouts: even though a dull razor will not cut you easier, you often have to make it work harder to do its job. A lot of times this will make the blade overcompensate and cut you. So make sure to keep your razor as sharp as possible at all times. If you haven’t used it in a few days, freshen it up with a good honing. Some like pre-shave oil and some don’t. The fact of the matter is that they help. Alot. Oils do a fantastic job of lathering up your have to make your razor glide easier and more efficiently across your face. This will give you a closer shave and it will help prevent getting cut! We strongly recommend giving this a try. That’s right; pull that bad boy… your skin that is. Pull your skin tight while you go in to shave it. This helps give your razor a nice, smooth surface to shave on. Having a smooth surface with minimal imperfections will help keep you from getting cut! And that’s why we’re here, right? It also has the added bonus of giving you a closer shave. You’re welcome. 4. Invest in a quality shaving soap. Or shaving cream; whatever you’re into. Just make sure what you’re using is quality, thick, smooth, and it wont water down. This will help make sure that you’re keeping a close shave the entire way through, and it will help protect your face and keep your razor from nicking you. This is a necessity, boys. 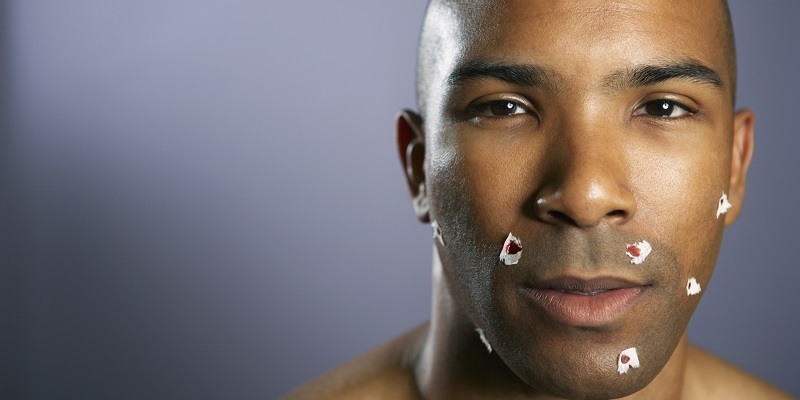 Using shorter strokes will ultimately give the razor more surface contact with your face. When you use long, quick strokes, it causes the razor to get clogged up with hair, and decreases the amount of surface contact it has with your face. Keep them short (5-10mm) and slow. Let your razor absorb any and all imperfections on that mug of yours. That’s right. Have you been going against the grain? It’s a big habit of a lot of people, but that doesn’t make it anymore alright. It’s just not a good idea. Going against the grain irritates your skin and the razor has to work a lot harder, this usually end up causing a cut. When you go with the natural growth of your hair, it’s much easier on your skin and it’s much less likely to tear. This is a win/win. If you must get a different angle, try going across the grain. Although, this is still a risk, just try to go slow. Crap, I tried these and I still cut myself, what do I do now? If you tried these and you still cut yourself, there is some sort of variable in there that caused it. But that’s neither here nor there. The goal now is to stop your face from bleeding, right? The first thing we would do it rise the cut with cold water, get the blood out. After it has been rinsed and dried off, dab the wound with chap stick. That’s right, chap stick. There are balms that are made especially for these types of cuts, but who keeps those around? Grab a chap stick and dab the wound. The thick paste will help close the wound and absorb the blood. Just be sure not to let someone grab the chap stick and use it! Good luck out there, boys.